June, 18, 2015 – Advertisers and technologists have a multi-billion opportunity to create better, more engaging, and more useful marketing experiences for consumers in today’s fragmented, technology-driven media market. According to the IAB Trends in Digital Media Report (October 2014), despite the growth in digital usage, a $30 billion gap in spending still exists compared with time spent on digital media. Technologists have been advancing media platforms to create content and delivery systems designed for today’s interactive and on-demand consumers, yet marketing messages that provide corresponding value and utility have lagged. As leaders in technology and digital advertising, we are on point to help direct a new paradigm. Our industries are dependent on each other and we need to understand the organizational attributes that shape our respective businesses so that we can keep pace with and grow the market. Yes, startups are more aware than ever of design, user experience, and emotion when building their products. And yes, Madison Avenue is becoming increasingly datadriven about its approach. But we need to do more. It is with these challenges and opportunities in mind that we are working with IAB to support an initiative that drives collaboration across the two intersecting industries of technology and advertising. The summits and this paper are just the start toward achieving a long-term industry vision that produces better solutions and experiences to move the world further—whether in commerce, entertainment, or news. Let’s champion new ways to drive collaboration across technology and advertising. Let’s address the barriers that inhibit better products, better consumer experiences, and better business results. Let’s create a richer, more useful exchange. We hope that you’ll join us. Ron Conway is the Founder of SV Angel, a premiere San Francisco-based angel investment firm, which helps startup companies with business development, financing, M&A, and other strategic advice. 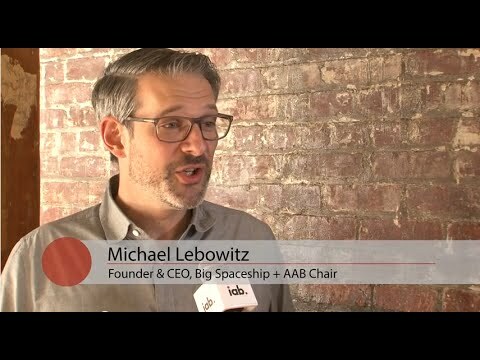 Michael Lebowitz is the Founder and CEO of Big Spaceship, an award winning digital agency based in Brooklyn, and serves as IAB Agency Advisory Board Chairman.